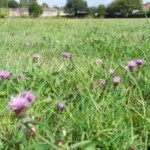 One of our key projects over the next few years is to enrich the flora of the park by establishing some wild flower rich grass areas – but why, and how? Apart from increasing the richness of the green environment for insects and birds (when did you last see a butterfly in the park? There are more butterflies in the neighbouring gardens! 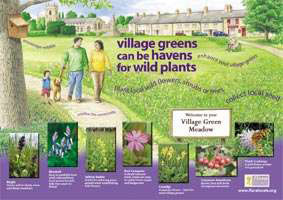 ), a flowery meadow is more pleasant to walk past than municipal grass. It all saves money, too! There’d be less time and fuel spent on mowing the grass, and less carbon entering the atmosphere. 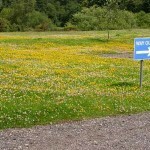 Mowing 3 times per year – compared to 15 times per year – would halve the cost of maintenance for meadow areas. By working with the council’s environmental maintenance team, we can significantly increase the diversity and quality of the park. We are planning to start with some test areas: some where the grass is left uncut to see what can flourish if not constantly mowed; and some where additional meadow flower seed is added to the existing grass area. We should be able to see the results in the next 12 months. We are indebted to Sue Everett, MIEEM for some of the material in this article. If you would like to know more, try visiting her website at meadowmaker.me.uk.